Happy third day of summer! I know it has technically only been summer for 3 days, but I feel like it’s been summer all month long. My kids already have tan lines from their swim suits because we have been swimming that much! And it’s been really hot here, especially this week, we’ve been 100 degrees or really close to it all week, which means we are drinking tons of water. For a little variety in the gallons and gallons of water we drink each day, I decided to play around with another fun flavored water combination. 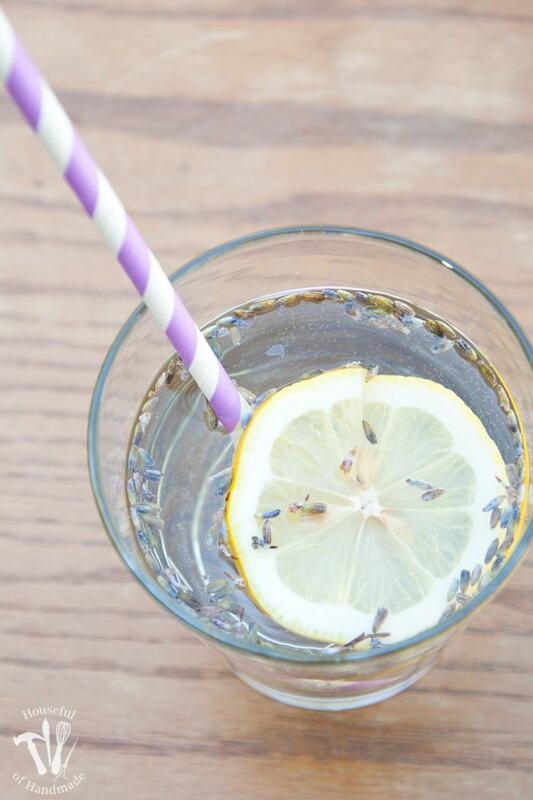 The result, a slightly rustic (but calming) Lavender Lemon Water recipe that can be thrown together without even breaking a sweat! I honestly don’t think I can call this a recipe. It’s just another really awesome flavored water combination. I am still loving the Strawberry Hibiscus Sparkling Water (and you just can’t beat the color the dried hibiscus flowers turn your water), but I needed another fun flavor so I can switch things up. I found some dried lavender buds in the bulk section of the grocery store and just knew I needed them for something. I am still planning on doing something with them in a frozen yogurt or ice cream because that just sound heavenly. But today I decided to keep it simple! If you haven’t tried lavender in your food yet you are missing out. I know it is a very popular scent for lotions and to put your baby to bed, but it tastes just a good as it smells. The only way I can describe the taste is rustic. I know rustic is not normally a taste attribute but to me it means earthy and something you would eat in the Tuscan countryside on an old table surrounded by friends. Yeah that may be my dream life! But my husband won’t let me move to the Tuscan countryside, so I have to enjoy my rustic food in my backyard while the kids play. 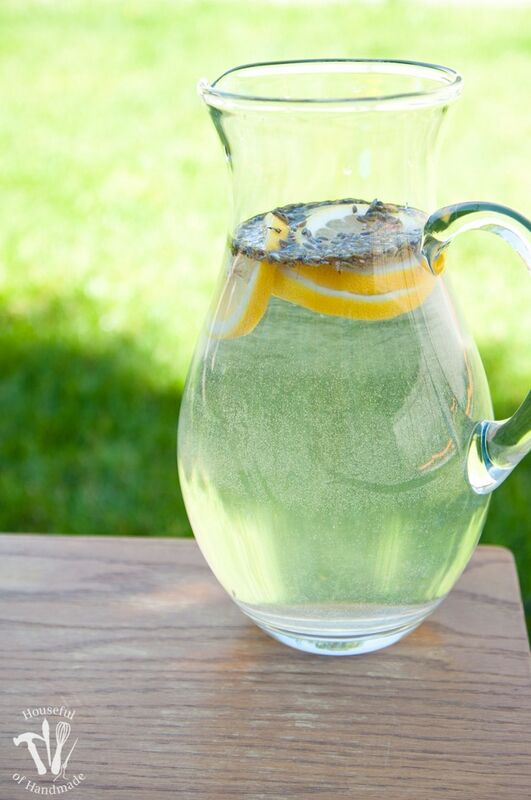 This Lavender Lemon Water is perfect for that. Or to accompany an asparagus quiche for a Sunday brunch with friends. Or in a large mason jar drink dispenser at a rustic country wedding. 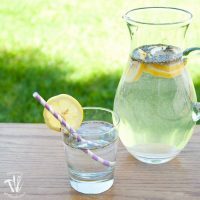 Lavender is what takes the regular lemon water to the next level and makes me feel like I am enjoying the quiet life in the country instead of raising my kids in the suburbs (which I also love cause Target is only a hop, skip, and a jump away). 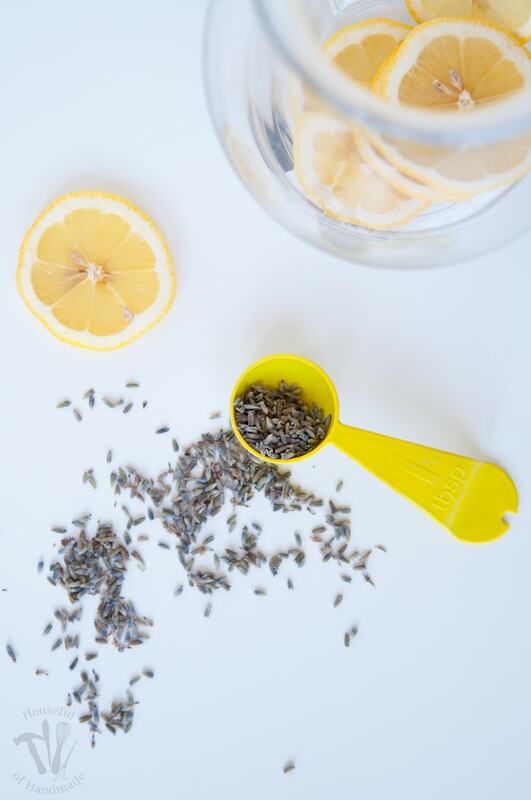 Ha ha, so if you want to try your hand at the simplest recipe to bring a little rustic lavender to your food, all you need is a lemon, some dried lavender and some ice cold water. Cut up your lemons however you want, I like slices cause they look pretty in the pitcher. 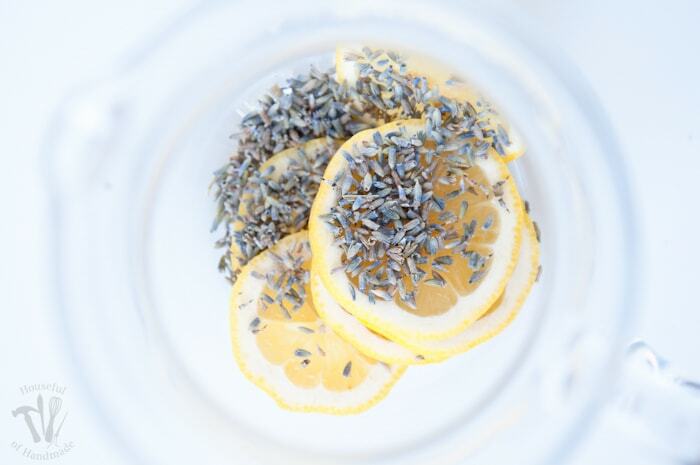 Sprinkle 1 Tbsp dried lavender buds over the lemon slices. 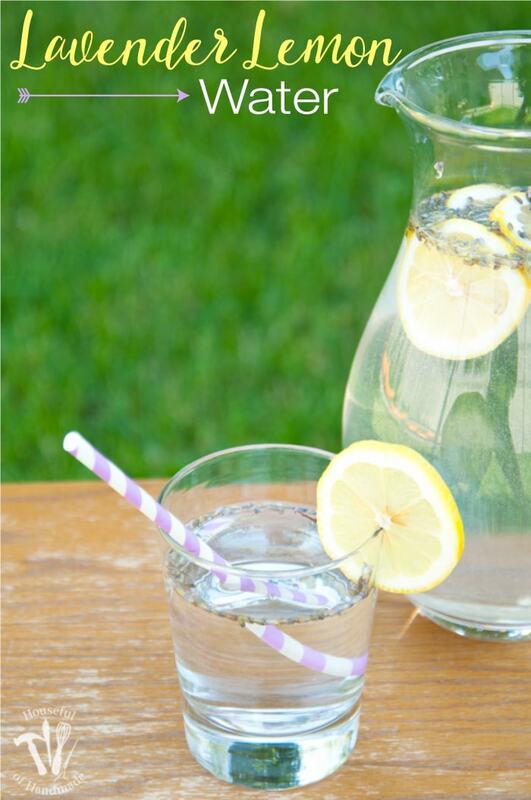 Fill your pitcher with cold water and give it a stir. 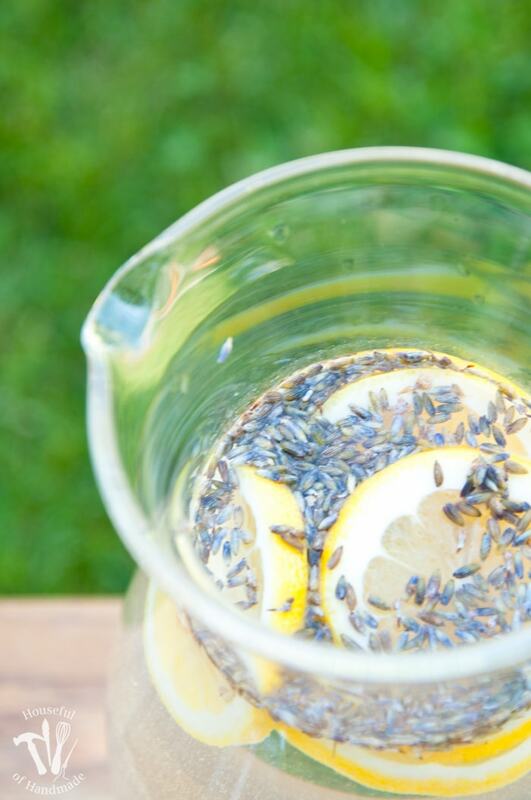 If you are using a beverage dispenser with a spout on the bottom, when you serve the Lavender Lemon Water you won’t have to worry about little lavender buds in your drink. But when using a traditional pitcher, plan to serve your delicious rustic water with a straw so your guests don’t have to drink with their teeth clamped tight! I like to make up a pitcher in the morning and then I can keep my glass full all day long. 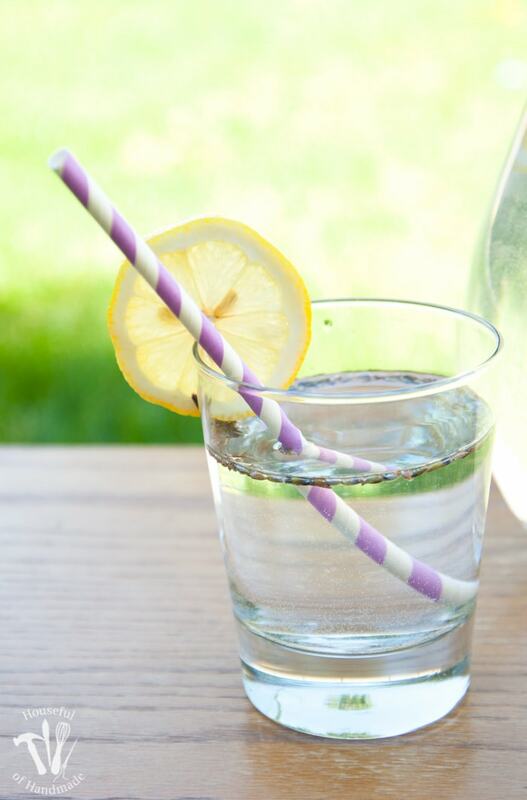 Turn your lemon water into something extra special. This lavender lemon water recipe is the perfect refreshment for a hot afternoon or Sunday brunch. 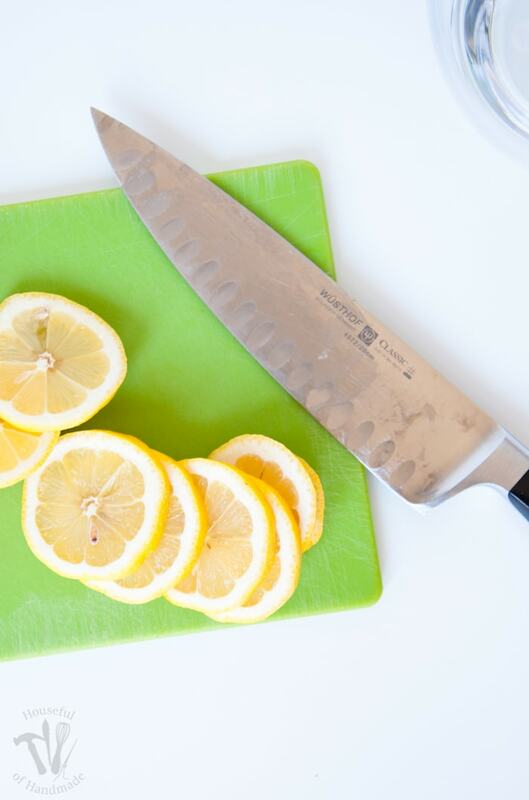 Slice lemons. Place them in 2 qt pitcher. Sprinkle lavender over the lemons. Fill pitcher with cold water. Stir. Are you ready to give it a try? I promise you won’t be disappointed. Thanks Shirley! Have a great weekend too. Fresh lavender is much better! Fresh lavender is awesome, when you can get it. I love using the dried lavender when I don’t have access to the fresh stuff though.